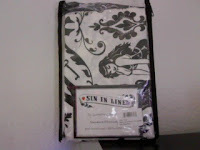 Sin in Linen™ is a rock and roll bedding company that is the passion of entrepreneur Sandy Glaze. While searching for bed sheets, she found precious little product to match her adventurous sense of style. Sensing she was not alone in her quest for self-expression in bedding, Sandy launched her new soft goods enterprise in partnership with her mother, Iris. I was sent Raven's Dream pillow cases to review and try. These pillow cases are black and white with a bold print of Ravens, Chains, Pinup girls, Flowers, lock and keys, handcuffs, and Ribbons. I loved everything about these pillow cases! I loved the different designs, the kinkiness, the color, and the pinup style girls on them. They would be great for anyone that loves unique stuff. or even for those who love the old fashioned pinup style stuff. I couldn't wait to open them up.. but then again I didn't want to open them because they are so cute! I love anything unique and this hit the nail on the head! I love the boldness of the prints. and the different sassy but girlie and pinup style it has. I was expecting the fabric to be rough but it was actually softer then what cases that I have. These would make great Birthday gifts, Christmas gifts, wedding gifts and more. For those who have more of a refined taste in unique products. I love, love, love them!